Most flat and hard traditional seats don’t provide the support and cushioning people need when sitting for long periods at work or in their car. As a result, many suffer unnecessarily from back pain and sciatica. The good news is there’s an ergonomic fix that lets people make their existing seat healthier and more comfortable. 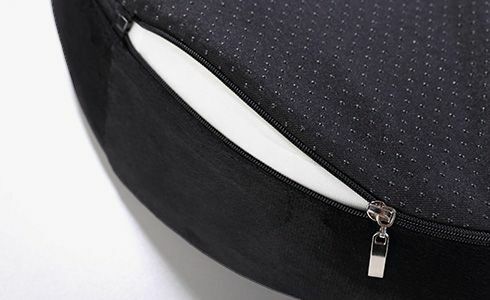 It’s FlexiSpot’s Luxury Memory Foam Seat Cushion. It features an O-shape not-flat design that eases pressure on the tailbone and contours perfectly to support the buttocks and upper thighs for proper weight distribution and correct spinal alignment. With the product dimension of 17.8 x 15.4 x 4.6 inches , it is ideal for any seat. It being a portable seat cushion, you could carry it around and place it wherever you are sitting –office chair, wheel chair, plane, car seat,sports bleachers,church,etc. We use 100% premium pure foam memory, skin-friendly short plush cover and durable zipper. Flexispot’s products have been strictly tested and inspected before being brought to market to assure the best quality. SKIN-FRIENDLY SHORT PLUSH COVER: Soft, comfortable short plush material eliminates the skin discomfort and marks on your upper thighs that is common with mesh covers. DOCTOR-RECOMMENDED DESIGN: The ergonomic design seat is recommended most by orthopedists and doctors as it can help to relieve pain from back,sciatica,etc. The O-shaped, wrapped design of the SC2 ergonomic seat cushion provides complete support for your tailbone, promoting proper spinal alignment and relieving pressure on the hips while you’re seated. The SC2 cushion was designed with ergonomic principles recommended by orthopedic doctors for promoting good posture, reducing strain on the spine, and relieving back pain such as sciatica. No sliding cushions to annoy you — the SC2’s non-slip rubber bottom keeps the cushion secure no matter what chair you’re sitting in. Binili ko for my dad who is experiencing sciatica (back pain). Narelieve pain niya and dala-dala namin anywhere, home, car, hospital. Thumbs up!